An award-winning device collects dew that could help quench the thirst of people living in arid lands. Judging from some of the comments on an earlier post " Death by solar panel: a bug's life ", insects are often under appreciated. But the little guys are ecologically important, and they can teach us things, too. For instance, how to capture water in a desert. Pak Kitae of Seoul National University has designed a water bottle after Onymacris unguicularis. Also known as the fog-basking beetle, the insect climbs the dunes of the Namib Desert each day to do a bit of morning yoga. Standing on its head, the beetle is able to collect moisture from the fog that rolls in from the Atlantic Ocean. The dew drips down the beetle's back to its mandible. Gulp. Left out over night, the stainless steel Dew Bank could capture enough dew to fill a water glass come morning. The night's lower temperatures cools the metal. As the air warms, water condenses on the bottle's dome and travels down its grooves into a collecting channel at the base. 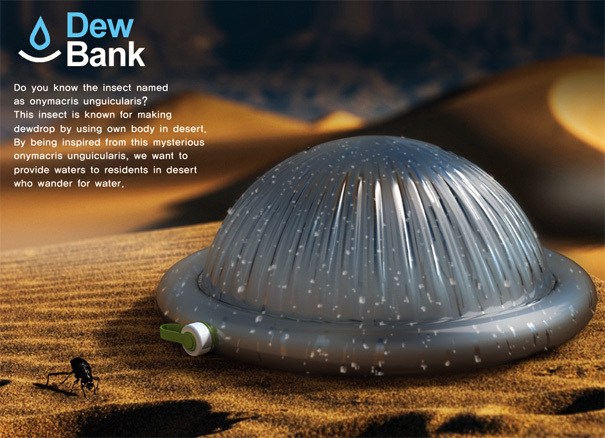 While Dew Bank may not solve the world's water problems, it might provide an added source of clean drinking water to people living in dry lands. This year Dew Bank took bronze in the Industrial Designers Society of America awards. Below the BBC shows the fog-basking beetle doing its dew dance in the Namib.